This day, December 18th, in 1928, marks the birth of Cecil John Miller. Raised in California, he earned his BA at San Francisco State College in 1953 and a doctorate in English Literature at the University of Pennsylvania in 1968. He graduated from Westminster Seminary in 1966, but by an uncommon arrangement had previously been ordained by the OPC some seven years earlier, in October of 1959, whereupon he was then engaged in church planting work in Stockton, California from 1959 to 1963. He later began serving as pastor of the Mechanicsville Chapel in Pennsylvania a year before graduating from Westminster, serving that pulpit from 1965 to 1972. Jack Miller was my pastor when I was a student at Westminster Seminary in the late 1970’s. The church at that time was still meeting in the rented gymnasium of a local YMCA. Every Sunday we’d get there early to set up folding chairs, and then prepared for a time of worship, typically up to two hours in length and including a sermon from Dr. Miller which might easily run up to 60 minutes long. But we never noticed the clock. We simply went home for lunch and spent the afternoon dwelling on all we had heard. Then we’d go back at the end of the day for more. 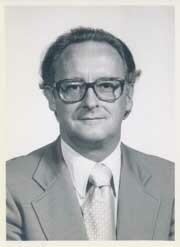 Dr. Miller was the pastor of New Life Presbyterian Church from 1973 to 1990, and a number of other New Life churches sprang from the model he established. But his greatest legacy came from his heart for missions, which led him on frequent trips to several countries, most notably Uganda, and from this work, World Harvest Mission began, and Dr. Miller served as director of WHM from 1991 until his death, April 8, 1996. World Harvest is now known as Serge, a name change which was put in place over the summer of 2014. Without recounting here his many books, which have been a great blessing to so many, I will simply note today that a new work has recently been issued under the title Saving Grace. This new book consists of 366 excerpts drawn from Dr. Miller’s sermons, portioned out for daily devotional reading. Truly, truly, I say to you, when you were young, you used to dress yourself and walk wherever you wanted, but when you are old, you will stretch out your hands, and another will dress you and carry you where you do not want to go.” (This he said to show by what kind of death he was to glorify God. )–John 21:18-19. How do we develop character in ourselves and others? We can’t teach character unless we have it, and that’s a problem because the church often lacks character. We can only get it as we learn about Jesus’s holy, powerful, transforming love. But we want so many other things besides the love of Christ : an easy life, popularity, acceptance, good principles, and even sound theology. But without love to Christ forming the character, all of it is only self-will. And without the love of Christ shaping our will and character, even good things become demonic, divisive, and cruel. So Jesus ends his message to Peter by saying, “Follow me. Follow me to your death and you will glorify God. Follow me and I will make you great.” Peter desired to be great and God is going to do that through his death. The heart of love for God is surrendering our will to him. Peter surrendered to Christ and became great. As we surrender to God’s love, our character is formed like Christ, and we also become great in God’s kingdom. To find out more about the book and how to order from the publisher, New Growth Press, click the title here: Saving Grace.